The demise of Atal Bihari Vajpayee was mourned by the whole nation. Leaders of all the major political parties in the country have given due respect to the BJP Patriarch. Unfortunately, The manner in which Amit Shah behaved at the funeral isn't appreciable. BJP President sat in the front row alongside the likes of PM Narendra Modi, President Ramnath Kovind, Vice President M Venkaiah Naidu, Former PM Manmohan Singh and Bhutan King Jigme Khesar. 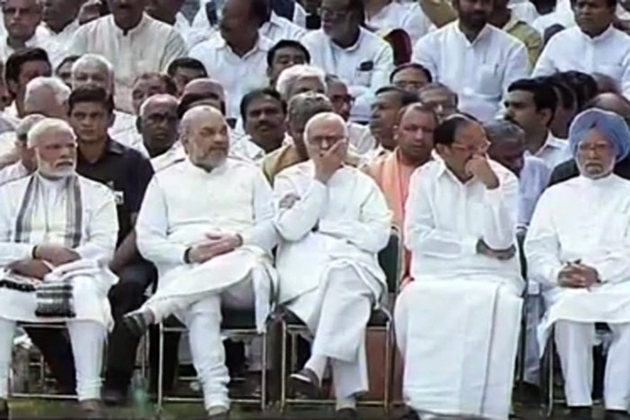 Much to everyone's shock, Amit Shah was spotted sitting with the crossed legs even though PM and LK Advani were on either side of him. Who would dare to offer such disrespectful pose at a funeral of India's Great Son? Netizens trolled Amit Shah for behaving in such a unacceptable manner. If he does such blunders, Can the BJP Chief have any moral right to question the party leaders who get embroiled in the controversies? A Wake-up Call For Modi's Trusted Aide!